zarinahtakesapaycut: PwC"s Chin Suit Fang and Leaderonomics's Roshan Thiran - a story of 2 professionals. PwC"s Chin Suit Fang and Leaderonomics's Roshan Thiran - a story of 2 professionals. Roshan Thiran is a professional who has an impeccable record as far as integrity goes, and is a great role model for all young entrepreneurs out there to emulate. The fact that Roshan wants to lead, and that he has set up Leaderonomics to lead as many young Malaysians as he can, is good news for the country. 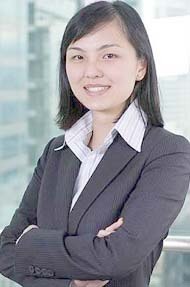 Ng Yin Ching, of PwC. 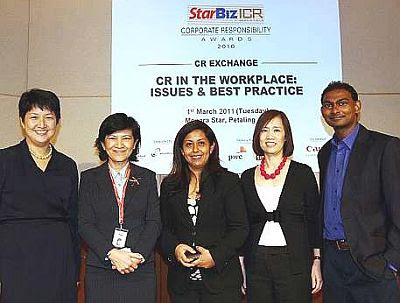 Then we have Ng Yin Ching, who at least has shown the gumption to refuse to attend the Forum on CR (Corporate Responsibility) In The Workplace:Issues& Best Practices, organised by The Star recently, when she knows that there are many questions that her firm must first answer before any Partner or staff of PwC Malaysia can hold up their head high in any event to do with ethics or good practices. Then we have Chin Suit Fang of PwC, 2nd from right. Ms Chin Suit Fang, how can you even share the stage with a professional like Roshan Thiran? When Johan Raslan, the Chairman of ICR Malaysia has left the building, and even Ng Yin Ching has distanced herself from the CR awards, why are you now standing beside true professionals who are a real credit to their professions? Has your firm, PwC Malaysia, or its Senior Partners, answered a single one of the very serious allegations raised here since the beginning of December last year? In the photo that now appears permanently at the title of this blog, you are standing with Chin Kwai Fatt, V.U Kumar and Khoo Chuan Keat. Have you asked Chin Kwai Fatt why he signed a false declaration with regards to the annual returns for PricewaterhouseCoopers Consulting Sdn Bhd (464379-U) for 2008, when he knew that the contingent liabilities were not disclosed, and that the company CANNOT meet these contingent liabilities if and when they may fall due?? Have you questioned VU Kumar on whether he has commenced investigations on Chin Kwai Fatt & Co regarding the allegations here as a member of the MIA (Malaysian Institute of Accountants) Investigation Committee? Have you questioned Khoo Chuan Keat on why he signed off on the annual returns for PricewaterhouseCoopers Consulting Sdn Bhd (464379-U) for 2009, when he knew that the contingent liabilities were not disclosed, and that the company CANNOT meet these contingent liabilities if and when they may fall due? Did you question Chin Kwai Fatt on why he had appointed people who have had absolutely nothing to do with the PwC Consulting Business as the Directors for PwC Consulting Malaysia Sdn Bhd (289801-A), before that company was disposed of to IBM Corp as the 'real' consulting arm in place of PricewaterhouseCoopers Consulting Sdn Bhd (464379-U)? The questions can go on and on, but the fact remains that PwC Malaysia and your fellow Senior Partners are still keeping quiet as if nothing is wrong. Why sully a forum that rewards companies that do things right by being there, while the allegations are hanging over your firm like the proverbial sword of Damocles , and the rope is getting more frayed by the day? Why did you come forward when Ng Yin Ching and even Johan Raslan have learnt better than to appear to play a role in questions that involve good corporate behaviour and ethics? How can you stand there when your firms reputation is already in tatters? PLC's are already very upset with PwC, and we will share the information soon.